The outing will be looking at three restoration projects undertaken by Malherbe Rust Architects and we will be taken around by Johan Malherbe. We will be starting the outing at Fredericksburg nr. Simondium. From here we will go to Diamant in the Agter Paal and finally end up at Phezantekraal near Durbanville where we will have our picnic lunch. Fredericksburg is normally closed to the public so this should be very interesting to see. Frederickburg lies on the Klapmuts Road at Simondium and is the home of the Rupert & Rothschild Vignerons. Take the N1 from Cape Town. Then take the EXIT 47 off-ramp. At the stop street turn RIGHT towards KLAPMUTS on the R44. Continue over the bridge and at the traffic light turn left onto the R45. This road leads past Babylonstoren and Fredericksburg is on your right close to the intersection with the Paarl- Franschhoek road. It has a large ‘Rupert & Rothschild Vignerons’ sign. Go to the visitors parking area near the wine tasting building. Allow travel time of 50minutes-1 hour. Fredericksburg was granted in 1694 to the Huguenot Jean Nortier. The farm was named after Frederick Wilhelm Elector of Brandenburg who was a Calvinist supporter and a Huguenot hero. His widow, Marie Vitu is believed to have built the humble house that is now the jonkershuis. In 1711 this farm and the adjoining one, which had belonged to Nortier’s brother, Daniel, were bought by Jean Durand who had farmed at Donkerhoek. The buildings on the farm were constructed over many years in the second half of the 18th century. We will be looking at the cellar/tasting building. From here we will go to Diamant in the Agter Paarl where we will see the now restored house that was built against the hillside by Jan Stephanus de Villiers in 1821. The house has a very fine main gable with fluted pilasters and much original woodwork including the windows. There are also some interesting outbuildings adjacent to the house. 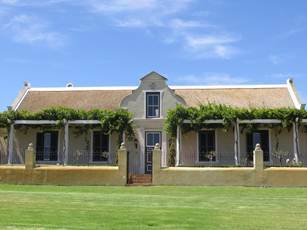 Finally we will end the outing at Groot Phezantekraal near Durbanville where we will have our picnic on the lawn. NB: VASSA outings are for paying members only! Please wear your badge at all times. “I am inspired by the Cape Buildings, old and modern. I started practicing in 1980, and am still lucky to be alive. Heritage work is my passion, and due to this I have been called many names, like ‘cavalier’ ‘persistent’ ‘pioneer’’ hard headed’ etc. But my passion remains to find novel solutions in the Cape Vernacular Architecture. I admire my mentors like Fox, Fagan, Visser, Osler, Rennie and all others young and old who inspire me. I will keep on reconstructing, restoring, interpreting and adapting Cape Buildings until I find the best solution”.